This Guide on Externally Powering Arduino Controlled Components Corrects the Basics of Wiring, Clears the Idea of Trimpot, Transistor, Diode. Most of guides which ranks higher on SERP, the websites which are popular but never talks about the basics, frequently misguides; forces to buy 50-60 years old junk electronics components which are not normal to use in mid 2015. Unavailability of expert manpower as pro grade blog writers creates a basic problem – situation becomes like monopoly of an ineffective alternative medicine for a treatable disease or mass promotion of banging the head on wall where filing a court case will give better return of investment. It is improbable to write a 100% junk on health or law. We are Externally Powering Arduino Controlled Components, not Externally Powering Socially Controlled Components, so let us be on-topic. Obviously, we are considering the fact that the reader is a newbie. External power supply to Breadboard is a different topic. The default Blink example of Arduino or our Mini Christmas Light are not the limits of doing whatever a user can do. Arduino is for sending the digital signal, it is basically not for powering in a primitive way. That is the basic reason why we told about the basic electronics components, using multimeter etc. Trimpot and Potentiometer are almost same within a normal usage range of voltage, amperage etc. Trimpot are modern and has an assigned number by the manufacturer. A trimpot is a small PCB mounted potentiometer that is only adjustable by using a screwdriver (but actually none change it once set) – it is designed to be set and left. Usually put in where you need to fine tune a filter or an oscillator etc. It has small voltage/current ratings compared to a normal potentiometer. A potentiometer which are known as log trim-pot is a potentiometer with a logarithmic taper. When someone is saying about a 10K log trim-pot, it is basically equivalent to a “Trimpot”. Trimpot is a loose terminology. Normally we use a blue colored, Bourns manufactured Trimpot. They have data sheets against the numbers. What we want to say is, if your basic electronics components kit have a blue colored trimpot, you only need to search with the number and get the data sheet only to crosscheck. Most commonly, you do not need to buy a big one. Another irritating parts is TIP120. Last practical use before the advent of Arduino was ’70s. As you are not electrical engineer, power MOSFET is the real modern component for you. MOSFET transistor means metal“oxide“semiconductor field-effect transistor. TIP transistor means Texas Instruments (Plastic) Power transistor. A TIP transistor is a NPN bipolar junction transistor. If you carefully watch the diagram of Mini Christmas Light, a 10K resistor was added in the GND pole before connecting to board. The thing is not easy. If everything blows away or become direct somehow, that one will save the board. If we use a power MOSFET, that 10K resister is optional like on that basic circuit. LED is diode not plain pencil torch bulb. With a TIP120 or any TIP, Arduino can blow away, if blowing away is rare, life-span may get decreased. It is too technical, but clearly know that, power TIP has been replaced by power MOSFET. In Wikipedia, you’ll see it is written – MOSFET are the most commonly used transistor now. When we are saying about one commonly used MOSFET like KN2222 – just simply perform a web search with KN2222 and comparing web search with TIP120. 2N3904, 2N3906 are other two very commonly used transistors. The morons uses TIP for various reasons. There are DIY guides on TIP which are very old. Secondly, making money and thirdly – using 2N3906 like common MOSFET can increase their work of writing and drawing the schema! Just like Trimpot, you only need to search with the number and get the data sheet only to crosscheck. Just to recall – vacuum diode, triode are not in common usage for many problems. They are actually great for some special instruments. TIP is somewhat like that. Last, as we said before in breadboard, you should use jumper wires. Jumper wires of a defined length will have a constant resistance and good contact. So, you understood that, many guides on Arduino are actually not modern. The basic theory is, for controlling the components like a DC motor, calculating resistance for transistor base is important. A high side switching of a voltage higher than the control voltage are not as simple as they seem. First, we need to calculate what the end component (like a DC motor) has the official amperage, voltage, frequency etc. A digital blink of a bulb means – instead of you are connecting and disconnecting the wire, Arduino or any controller is doing it. That is automation. Code written and diagram drawn by Simon Monk on Adafruit. We will only add one 10K Ohm Resistor at GND before connecting to Arduino. Instead of the motor, if you add an multimeter, you will see the reading of voltage, is not it? This Article Has Been Shared 8134 Times! 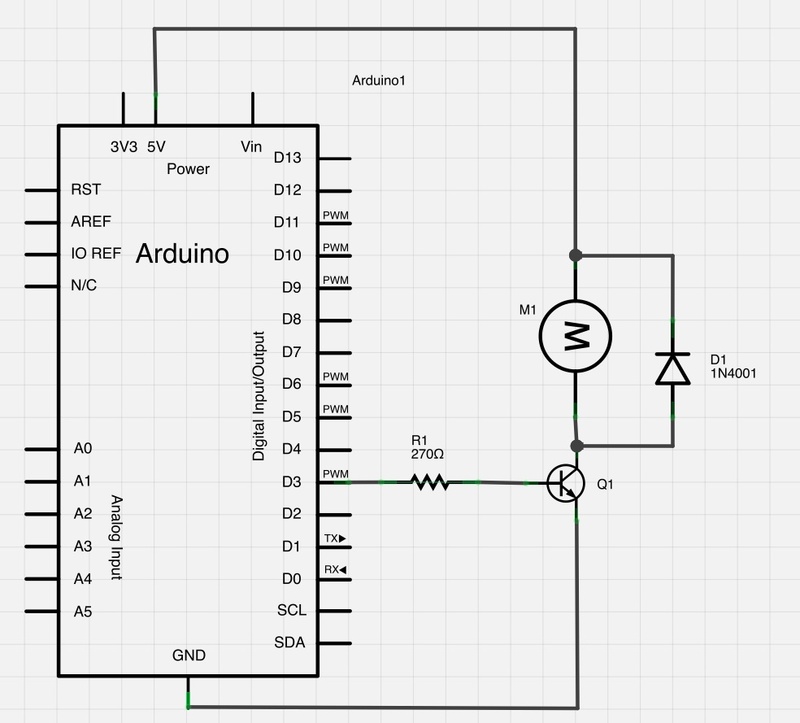 Cite this article as: Abhishek Ghosh, "Externally Powering Arduino Controlled Components : Basics," in The Customize Windows, August 9, 2015, April 23, 2019, https://thecustomizewindows.com/2015/08/externally-powering-arduino-controlled-components-basics/.